Copper alloy radiate or nummus of an uncertain ruler. The coin is in very poor, corroded condition, is 14mm in diameter and weighs 0.84g. Copper alloy radiate or nummus of an uncertain ruler. 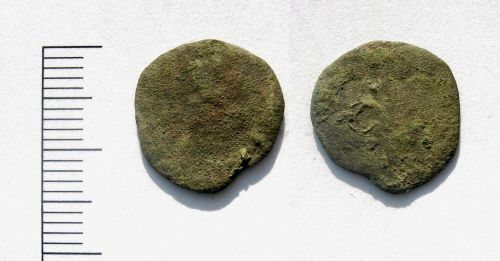 The coin is in very poor, corroded condition, is 15mm in diameter and weighs 0.85g. Copper alloy radiate or nummus of an uncertain ruler. The coin is in very poor, corroded condition, is 12mm in diameter and weighs 0.63g. Copper alloy radiate or nummus of an uncertain ruler. The coin is in very poor, corroded condition, is 17mm in diameter and weighs 0.97g.